Del. Shawn Tarrant isn’t giving up on being re-elected to a second term in office despite losing in the primary election four months ago. Tarrant, D-Baltimore City, is mounting an unusual campaign as a write-in candidate seeking to unseat Del. Frank M. Conaway Jr., who was the subject of a recent article detailing Conaway’s unusual videos and writings. Tarrant bills himself as “the delegate that makes sense.” Tarrant was not immediately available for comment. The race for the 40th District was all but decided until this week. There are no Republican candidates, which effectively made the June primary the only election necessary in the Baltimore City District. Running as a write-in candidate is a difficult task. 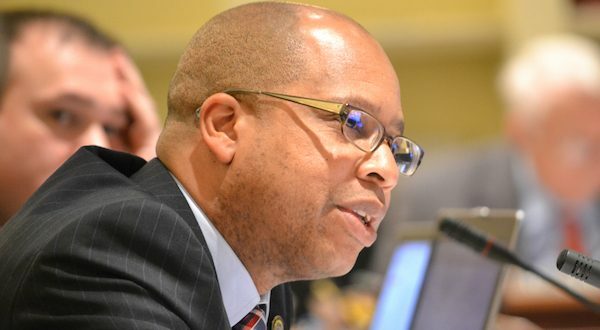 Four years ago, Julian Jones came within 98 votes of defeating Baltimore County Councilman Kenneth Oliver in a Democratic primary where 71 percent of the voters voted for someone other than the incumbent. Jones opted to run as a write-in candidate in a district where there was no Republican challenger. Oliver received 88 percent of the vote in the 2010 General Election. Conaway took the videos down in the hours after the article was published. Conaway self-published another book in 2001 entitled “Baptist Gnostic Christian Eubonic Kundalinion Spiritual Ki Do Hermeneutic Metaphysics: The Word: Hermeneutics” and is available on Amazon.com. Conaway was the subject of a 2006 City Paper article that, through court records, detailed reports of mental illness and domestic violence.